Bob's Training Blog: Even Pacing! 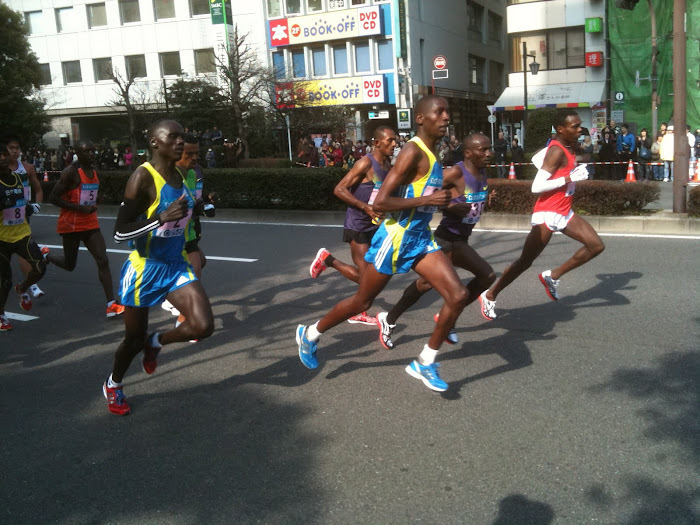 2011 Tokyo Marathon. Leaders at 6K. Stuck out my arm, pushed the iPhone camera button. Complete luck. Good week. The even pacing day was Friday. 7:30pm - 9.2k with 5k time trial. 11:30 - 20k in a light rain. Cold, but I wore a lot, so was warm enough. 2:00:45 — Out: 1:00:22.87 In: 1:00:22.78. Even pacing! And that's without checking my watch at all. Pace/k: 5:49/45/11/4:50 last k in 4:38. Not a bad run, esp. considering I did 20k on Friday (still not really used to doing "long" runs). Great run today by my favorite runner, Kayoko Fukushi, at Osaka - 2:22:17, clearing the Japan Federation mandated 2:22:30 for automatic selection for the Rio team. And also by my favorite male runner, Scott Brown, 1:22 in the Half Marathon version of the same race. Three weeks over 80k, so will take an easy week next week, resting Monday and Tuesday. Look like you are going well. Good stuff. Ha ha, the Senator must have been inspired by Fukushi's run. Well done her! Nice going yourself Bob - to get within 1 second on an out/back is amazing. Serious runner since age 34. Member of Namban Rengo, Tokyo's International Running Club.